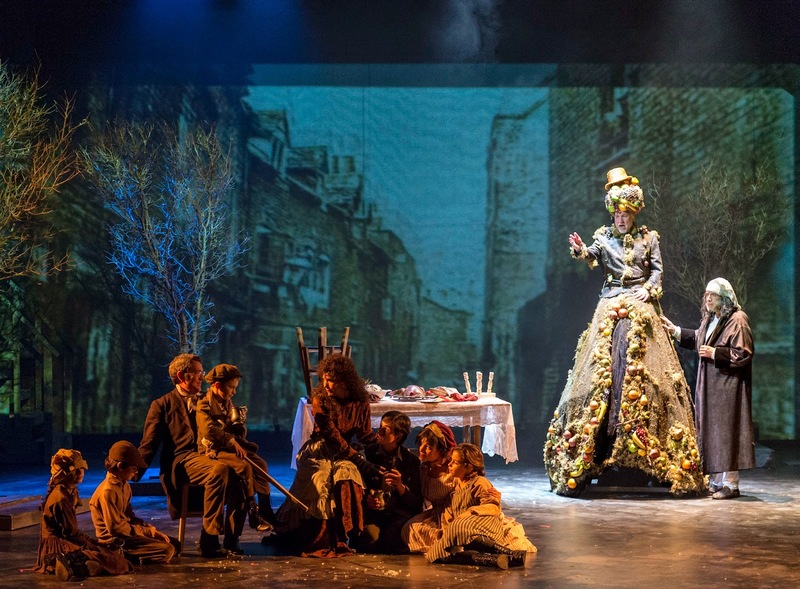 This past weekend, I had the pleasure of reintroducing myself to repertory theatre company, A Noise Within, and experiencing their adaptation of Charles Dickens' A Christmas Carol. Co-directed and adapted from the novella by artistic director, Geoff Elliott, Elliott also stars as everyone's favorite curmudgeon, Ebenezer Scrooge. 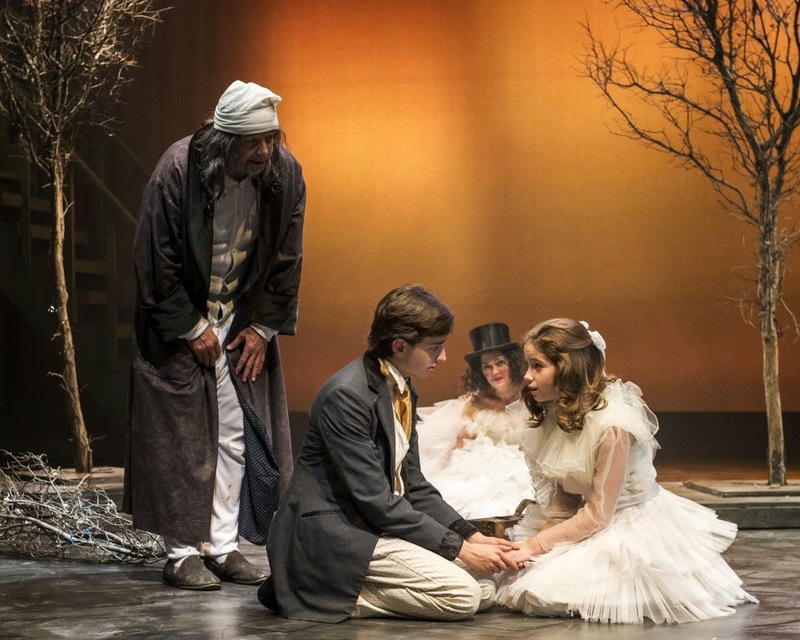 Also co-directed by Julia Rodriguez-Elliott, the production of A Christmas Carol is beautifully designed with a thrust stage that also incorporates the back of the house for entrances and exits that bring the audience into the classic tale much like that of the Narrator (played by the dapper Freddy Douglas) guiding the audience through the story with cross overs on stage peppering the play with Dickens's prose. I had not been to a show in the company's new space, but was both nostalgic for the old theatre's charm and yet impressed by the new theatre's historical landmark home. The building that houses A Noise Within was designed by 20th century architect, Edward Durell Stone, of Radio City Music Hall, JFK Center for the Performing Arts, and Museum of Modern Art fame (to list a few). The outdoor fountain set against a screen of white perforated masonry in front of a wall of windows gives the theatre a grand and professional feel elevating this little theatre company into what feels like the "big leagues." The theatre is state-of-the-art with an airy feel that makes it impossible for there to be a bad seat in the house. The production starts off strong with the moody silhouette of a children's ensemble playing bells along to original music composed by Ego Plum. We quickly meet Ebenezer Scrooge as he whacks his way through dead trees and the children's ensemble with a cane and a hatred for all that is joyous around this time of year. The moving set pieces that put together Scrooge's office and the untidy desk of the overworked but humble Mr. Cratchit, start the tale off right with all of the drab and cold it requires for the beginning of Scrooge's transformative journey. In contrast to Elliott's miserly Scrooge, Rafael Goldstein plays the light and charming Fred, Scrooge's nephew, who had one of my favorite performances of the night. But by far some of the most impressive moments of the show are the entrances of the ghost of Marley and the Ghost of Christmas Past, the exquisite and abundant costume of the ghost of Christmas Present, and the ominous lurking of the Ghost of Christmas Yet-to-Come. The ghost of Marley, Scrooge's deceased business partner, makes for a truly terrifying entrance complete with chains dropping from the hidden catwalk and the actor (Mitchell Edmonds) entering from the back of the house pulling behind him chains that both come from beyond the back of house and balcony. The disruptive and effective entrance is interrupted a bit with Christmas lights wrapped around the ghost's body. 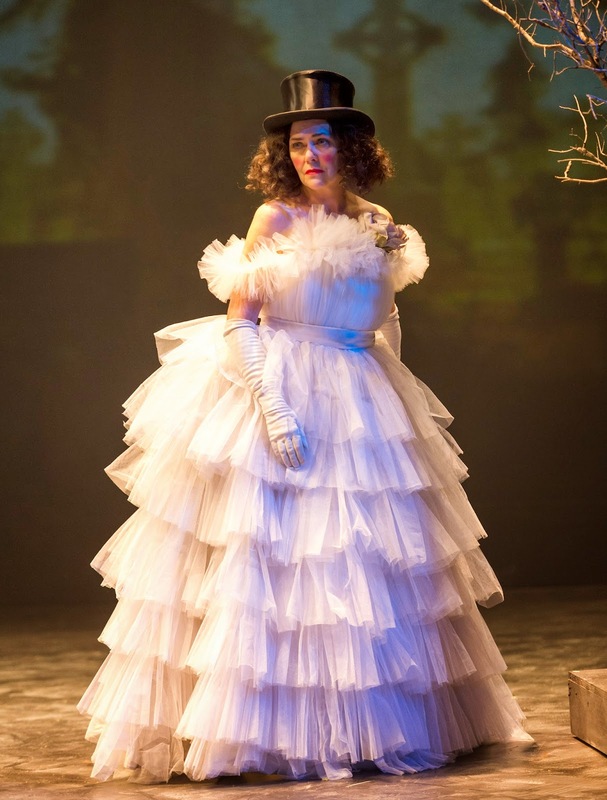 But nevertheless, the scene is dramatic, haunting and in direct contrast with the next character entrance, the Ghost of Christmas Past, played by the very talented Deborah Strang, who enters Scrooge's room on a swing in a top hat and ruffled tule dress with all the whimsy and nostalgia of a fairy godmother. And indeed, while showing Scrooge himself as an isolated child, she also shows him the good parts of his past: his beloved sister bringing him home from school, a spirited party at his old employer's warehouse with a lively dance in bright costumes and wigs, and his former love, Belle, played by Allison Elliott. The mood turns sour as Scrooge's greed isolates him from all that is good in his life, including Belle, his family, and his community. Enter the Ghost of Christmas Present in an abundant costume and headdress decorated with fruit and harvest and built upon a rolling platform that gives the effect of gliding, Alan Blumenfeld brings a refreshing cheer and joy to the play punched up with an infectious laugh. It is with this act that the play opens into a musical, for better or worse. While the handful of musical numbers make for a more family-friendly event, I rather enjoyed the dark brooding production with the occasional comedic relief brought on by the subtle deliveries of Elliott's Scrooge. The musical numbers seem not to fit at first, but later earn their place with the culmination of an ensemble chorus echoing the "Glorious" morning Ebenezer Scrooge "wakes" from after his life altering night. 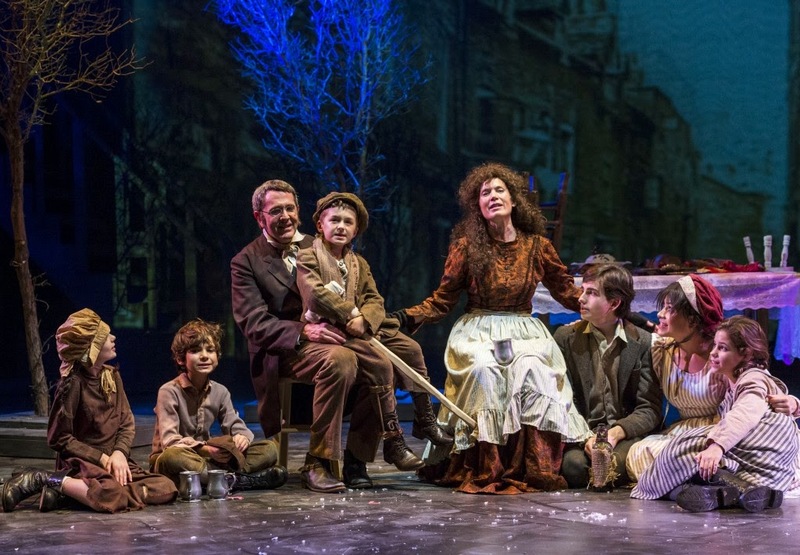 The Cratchit family, led by a heartbreaking Stephen Rockwell as Mr. Cratchit and Jill Hill as Mrs. Cratchit, all give solid and loving performances that make for a compelling and empathetic turn of events for Scrooge. The grim foreboding visit with the Cratchit family is in stark contrast to the boisterous dinner at Fred's home where his guests toast his lonely uncle, Ebenezer Scrooge, and then take turns in a game of clue guessing what kind of animal Fred has in mind only to reveal he is describing his uncle. The game is concluded with a musical number that echoes the activity just played as opposed to furthering the story along. However, the musical numbers do provide a lightheartedness that lift the otherwise heavy production. Much like the novella, the entrance of the Ghost of Christmas Future shifts the play into the bleak dark of the future. The production utilized a bit of modern dance (complete with ensemble in black leotards) for this transition that seemed to stick out in an otherwise period-appropriate play. But to the company's credit, their confidence in borrowing from other art forms to hit a particular tone are effective and memorable. With another outstanding costume on stilts, the ominous and silent Ghost of Christmas Future shows Ebenezer what is to come if he does not change his ways. 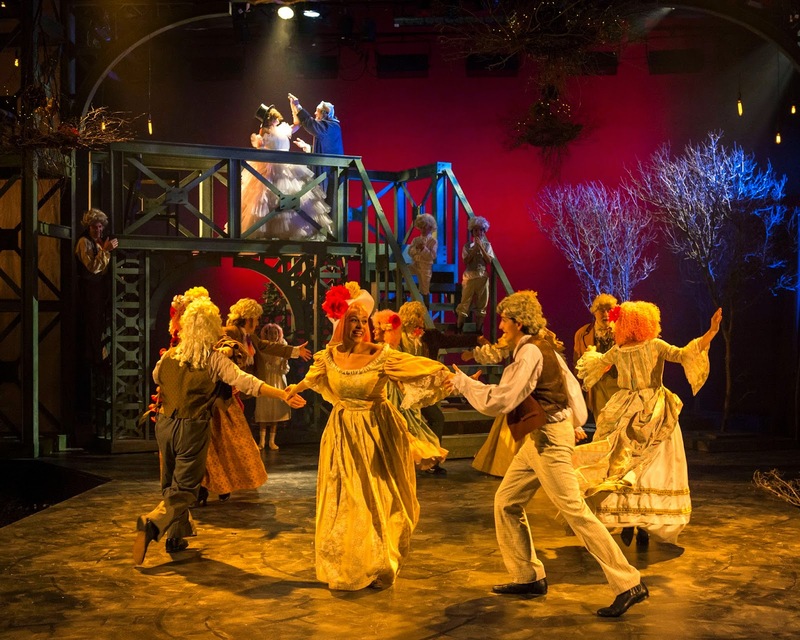 There is another cabaret-like musical number here with grave robbers who have pilfered Scrooge's stuff or as they say, to profit from a man in death who refused to help other's profit from him in life. The number, led by the powerful Strang (in this role playing the Charwoman), again does not move the story forward but rather brings in a more family-friendly element making for a more wholesome experience. By the end of the play, Elliott's Scrooge revels in all of the kooky joy and ecstatic celebration his character has earned with a second shot at life. A catharsis for the audience who, even though already knows how the story ends, laughs along in the merriment and silliness of it all. A Noise Within completed their production by wishing the audience a "Merry Christmas!" and then passing out apple cider. This is a wonderful production of a beloved Christmas tale that sends you home with an inspired night of Christmas spirit and a full heart. A Christmas Carol runs through Tuesday, December 23rd. Tickets can be purchased at www.anoisewithin.org or by phone: 626.356.3100 ext 1.